In the late 1960 and early 1970s radio station 2SM and confectionary maker Hoadleys staged an annual Battle of the Sounds to discover Australia’s best band. 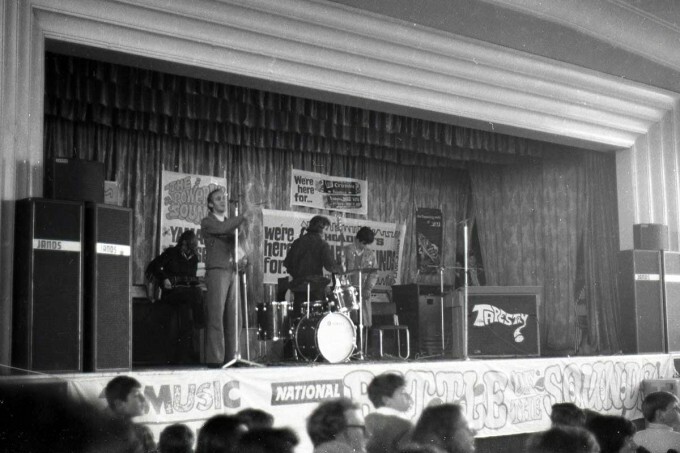 In 1970 the bands competing include Flying Circus, Freshwater, the Cleves, Pyramid, NZ Fantasy Band, Autumn, the La De Das, Pirana, Elm Tree, and Clik. Jands provided a column PA system and lighting for the heats and finals of the Sydney events. “As long ago as Johnny O’Keefe, Australian rock and roll had hoped for international recognition. Now it became an obsession, catered to by a national competition called the Hoadley’s Battle of the Sounds. The prize was a boat trip to London. It’s impossible to imagine anything like the Battle happening now or ever again. Each year the nation’s biggest bands – and quite a few just looking to be noticed – pitted themselves against each other in a national contest sponsored by Hoadley’s and organised by host radio stations in each capital city. Every band was given three minutes on stage. The judges awarded points. The final saw all the state winners run the same gauntlet. Another three minutes to show their wares. Another set of judges. Oh thats brilliant… I was the drummer from Elmtree and remember our role very well. Do you have any more photos to share….possibly of my band. Thanks for putting this bit of history back up there.